Because rhetoric alone cannot sustain you. Being there. You'll want to walk the old town, tour the Palamidi fortress, perhaps visit the Archeological Museum and the Peloponnesian Folklore Foundation Museum, both have received good reviews. A few churches and mosques are noted in the guidebooks. You may find the small island in the harbor, the Bourtzi, interesting. It has been used for many things over the years including the home of the public executioner and an upscale hotel (but not at the same time). For fans of recent history, the tumult of the War for Independence found Nafplio at the center of things. The capital of Greece from 1829 to 1834 was located there and the first Prime Minister, Kapodhistrias was assassinated there. The bullet hole is still visible near the door of the St. Spyriodon church. News is that the Alpha Bank has a collection of Greek Bank notes open for public view. Getting there. You can get there by bus and train in addition to ferries. The ferry trip will pass by interesting islands such as Hydra and Poros. Ferry connections exist from Piraeus, Hydra, Spetses and other cities. Trains arrive from Argos and Corinth. There are frequent busses to Athens. Please consult agencies for current schedules. I am not responsible for changes or missed connections. Staying there. There are a number of hotels in the main city. 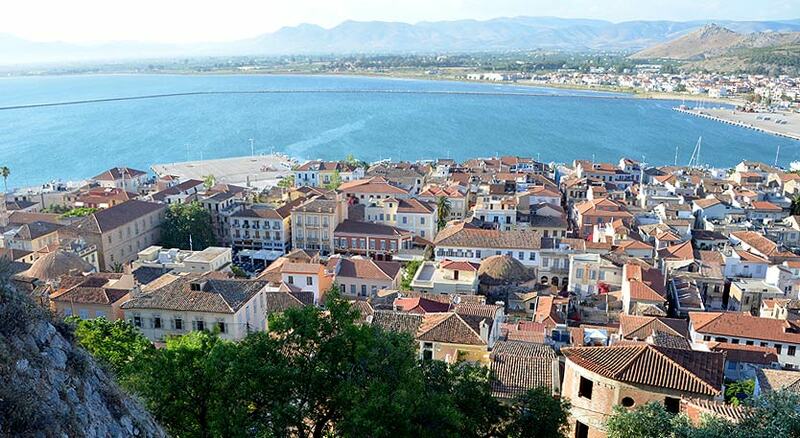 Nafplio receives mixed reviews in the books for accommodations, but you can be very comfortable there. Check out hotels in restored mansions. Restaurants and shops receive better reviews. Beaches. The beach resorts of Tolo and Karathona (between Tolo and Nafplio) are close to hand.